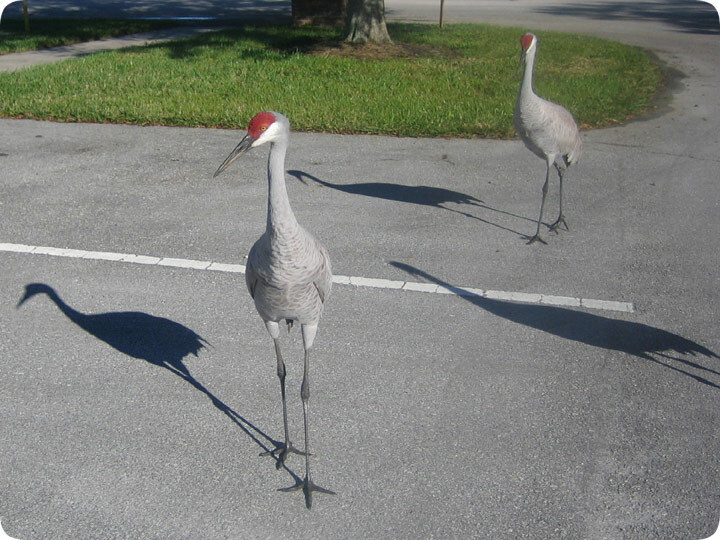 02.18.2005 - Sandhill Cranes, Grus canadensis are fairly common in Florida. They are a very large bird, with a wingspan of about six feet. I've read that they are the oldest known extant bird species, with unchanged fossils going back 10 million years. As a dominant bird species, they are usually fearless of other birds and most other animals, including humans. They became a nuisance in this parking lot of this company, where they routinely threatened the employees and customers with aggressive behavior. I was called in for Sandhill Crane control. I am not allowed to trap or touch or harm the animal, but as with many nuisance bird species such as Canadian Geese, I was able to employ a system of daily distraction and deterrence via the use of sight lasers and water jets. These techniques, employed on a daily basis, convinced the birds to stay away from the parking lot, and soon the people were able to use the parking lot in peace. Really though, these are beautiful birds, and I love having them around. I usually feel lucky to hang out in the vicinity of these fantastic flappers. Do it yourself: Visit my How To Get Rid of Birds page for tips and advice.